April is Earth Month and there are so many ways in which our food systems impact the environment. One such way is food waste. Did you know? 133 billion pounds of food is sent to the landfill every year, which accounts for almost 25% of harmful greenhouse gas emissions. One way we can combat food waste is with “root to stem” cooking. Many times, the parts of the plant that we consider to be scraps are edible. Roots, stems, seeds, stalks, and leaves are not only edible, they’re also nutritious! For our Mixed Berry Chia Jam recipe, feel free to leave stems on the blueberries and raspberries and leaves on your strawberries. Once it’s pureed, you’ll never know it’s there. Plus you’ll get an added dose of fiber, iron, calcium, and vitamin C.
For our Mixed Berry Chia Jam, feel free to leave stems on the blueberries and raspberries and leaves on your strawberries. These will give you an extra dose of fiber, iron, calcium, and vitamin C.
1. In a saucepan over medium heat, combine water, blueberries, raspberries, strawberries, lemon juice, and lemon zest. Heat until berries begin to release their juices. Transfer to a blender and puree. Add chia seeds and return to saucepan. Bring to a simmer for 1 more minute or just until chia seeds have softened. Remove from heat and chill. 2. 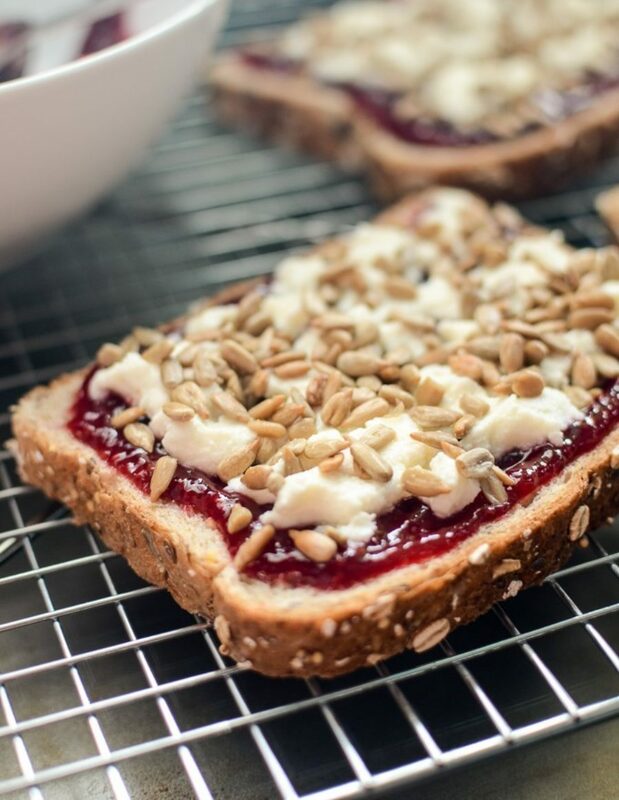 Toast each slice of bread. 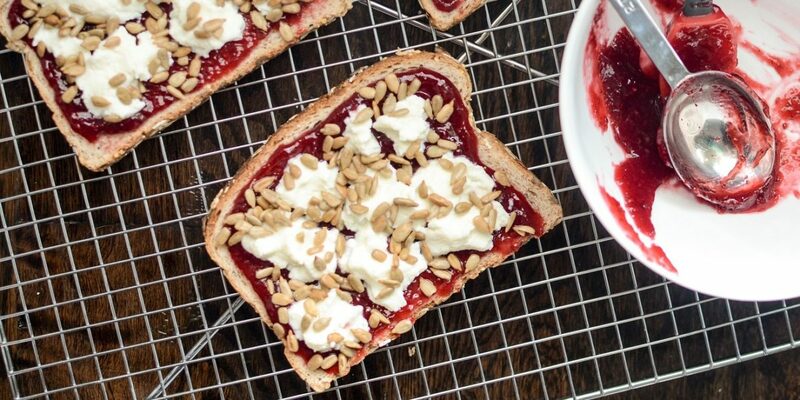 Top with 2 tablespoons jam, 2 tablespoons ricotta, and 1 tablespoon sunflower seeds. NOTE: Recipe will produce extra jam.